People with panic disorder have feelings of terror that strike suddenly and repeatedly, most often with no warning. The frequency and severity of panic symptoms can vary widely. A person with this condition usually can’t predict when an attack will occur, and so many develop intense anxiety between episodes, worrying when and where the next one will strike. Between panic attacks, there is a persistent, lingering worry that another one could come at any minute. Panic disorder occurs when you experience recurring unexpected panic attacks. The DSM-5 defines panic attacks as abrupt surges of intense fear or discomfort that peak within minutes. People with the disorder live in fear of having a panic attack. You may be having a panic attack when you feel sudden, overwhelming terror that has no obvious cause. You may experience physical symptoms, such as a racing heart, breathing difficulties, and sweating. Panic attacks often consist of a pounding heart, sweatiness, a feeling of weakness, faintness, or dizziness. The hands may tingle or feel numb, the person may feel flushed or chilled. There can be chest pain or smothering sensations, a sense of unreality, a fear of impending doom, or loss of control. The person may genuinely believe they are having a heart attack or stroke, losing their mind, or on the verge of death. Symptoms of panic disorder often begin to appear in teens and young adults under the age of 25. If you have had four or more panic attacks, or you live in fear of having another panic attack after experiencing one, you may have a panic disorder. Panic attacks produce intense fear that begins suddenly, often with no warning. An attack typically lasts for 10 to 20 minutes, but in extreme cases, symptoms may last for more than an hour. The experience is different for everyone, and symptoms often vary. The symptoms of a panic attack often occur for no clear reason. Typically, the symptoms are not proportionate to the level of danger that exists in the environment. Because these attacks can’t be predicted, they can significantly affect your functioning. A Panic attack call your Depression Doctor in Kanpur. Fear of a panic attack or recalling a panic attack can result in another attack. The panic attacks may not be due to the direct physiological effects of use or abuse of a substance (alcohol, drugs, medications) or a general medical condition (e.g., hyperthyroidism). 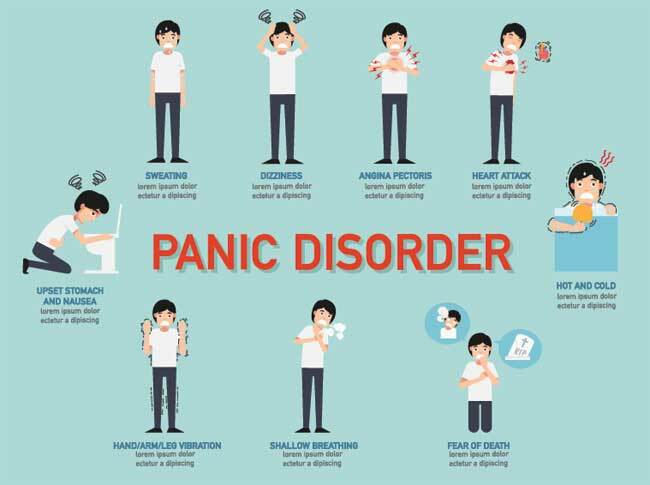 Though panic attacks can occur in other mental disorders (most often anxiety-related disorders), the panic attacks in panic disorder itself cannot occur exclusively to symptoms in another disorder. In other words, attacks in panic disorder cannot be better accounted for by another mental disorder, such as social phobia (e.g., occurring on exposure to feared social situations), specific phobia (e.g., on exposure to a specific phobic situation), obsessive-compulsive disorder (e.g., on exposure to dirt in someone with an obsession about contamination), posttraumatic stress disorder (e.g., in response to stimuli associated with a severe stressor), or separation anxiety disorder (e.g., in response to being away from home or close relatives). Panic disorder is associated with high levels of social, occupational, and physical disability; considerable economic costs; and the highest number of medical visits among the anxiety disorders, although the effects are strongest with the presence of agoraphobia. Though agoraphobia may also be present, it isn’t required in order to diagnose panic disorder.